Expect Gov. Roy Cooper to restate his preference for a statewide school bond referendum during his State of the State speech tonight at 7 p.m.
Cooper believes a $2 billion school bond is a better option than a pay-as-you-go plan proposed by Senate leaders, and approved by the Senate Rules Committee last week. “A successful school bond is a smarter way to do business because it locks down financing now and still leaves funding to get good teachers and principals in the classroom,” Cooper said in a statement. In an odd twist, Cooper’s support for a school bond puts him on the same side of the issue as Republican House Speaker Tim Moore, who has proposed a $1.9 billion bond referendum. Under Senate Bill 5 (SB 5), the plan proposed by the Senate leadership, the state would use money from the State Capital and Infrastructure Fund (SCIF) to pay for school construction and renovations. State Sen. Harry Brown, (R-Onslow), said SB 5 would raise about $6 billion for K-12, community colleges and the university system, with each receiving $2 billion for construction and renovation projects over a 10-year stretch. SCIF currently receives 4 percent of state revenue to pay down debt and for capital projects for state government and the UNC System. Under SB 5, the amount of state revenue would be bumped up to 4.5 percent to generate additional revenue for school construction projects and renovations. Cooper contends that strategy would take away money from other needs. “Skimming money that should go to teacher pay raises and other school funding is like using your gas money to buy a new car,” Cooper said. More than $8 billion in school construction and renovation needs have been identified throughout the state. 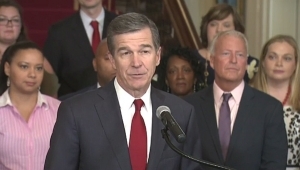 Cooper’s State of the State address can be seen live at http://www.facebook.com/NCgovernor/. Also check local TV listings for broadcasts of Cooper’s speech and the Republican response.